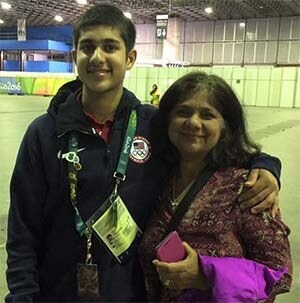 A debut in 2012 when the World Junior Championships were staged in the Indian city of Hyderabad and China’s Fan Zhendong won the Boys’ Singles title, the name of Kanak Jha of the United States appears on the entry list for the forthcoming Sun International 2016 World Junior Championships. Play commences in Cape Town, South Africa on Wednesday 30th November. Notably it will be the fifth consecutive time that he has competed in the prestigious annual competition. Only 16 years old he is a seasoned competitor; significantly he won the 2014 North American Cup, a success that gained him a place in the Liebherr Men’s World Cup later that year. More recently he was on duty at the Rio 2016 Olympic Games. Now based in Halmstad, Sweden, the avowed aim is to improve on the performance of one year ago in France when he was beaten in the second round by China’s Xue Fei, the eventual runner up (11-4, 11-7, 12-10, 11-6). Throughout his career Kanak and for that matter, elder sister Prachi, have been supported by mother, Karuna Jain. Notably, the only one of the World Junior Championships when Karuna Jain has not been present was last year in France. In the Boys’ Team event, Kanak Jha will line up alongside Adar Alguetti, Victor Liu and Jack Wang; they are the no.12 seeds; in the Boys’ Singles event Kanak Jha is the no.21 seed.